happylucky no. 1 is proud to present Haptics, a group exhibition that explores the sensory relationship between the realms of art and craft. 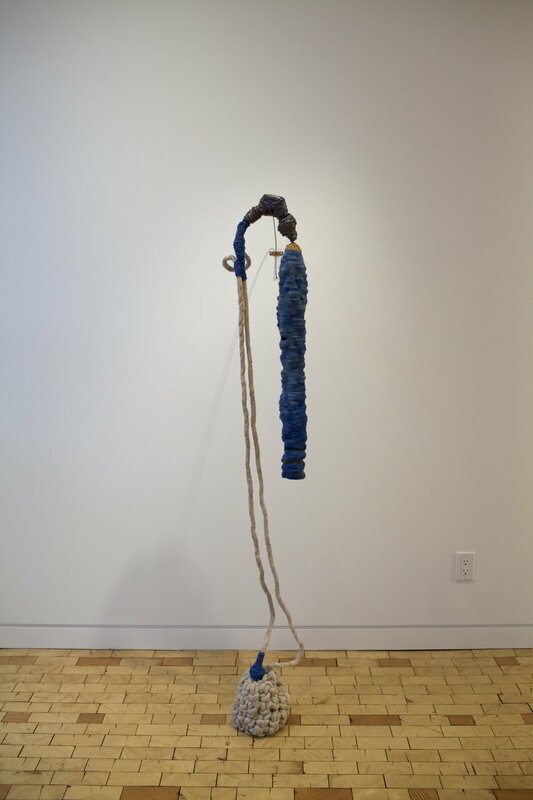 Featuring works by Barbara Bertieri, Frid Branham, Kimberly Carmody, Lisa Cooperman, Joetta Maue, and PD Packard, this exhibition provides a cross-section of contemporary artists who use materials associated with craft: clay, thread, dyes and inks, or precious stones. Materials like these require a viewer to deploy sensuality to engage with the work. The biomorphic kidney forms of Kimberly Carmody- which come covered with holes, dots, and glaze -invite the viewer to directly touch and engage with their distinct noises, textures, and colors. Without the touch of the human hand, these objects cannot be experienced. PD Packard’s channeling of the ancient practice of dying Japanese kozo paper seem timeless with geometric and natural motifs. Although delicate in their layered patterns and compositions, the papers are durable and can be subjected to endless printed layers of colors. On the other hand, Lisa Cooperman and Frid Branham use soft, layered textiles to create compositions that straddle sculpture and ephemera. In a similar vein, Joetta Maue uses textiles in her own work. Maue’s use of embroidery evokes transient nostalgia, comfort, sexuality, and a history of handcraft. However, Barbara Bertieri comes closest to engaging with the viewer on a bodily level since she primarily creates functional jewelry. Her practice uses a myriad of techniques and materials that place her work uniquely between art and craft. Pendants that are constructed like a gold-leafed Medieval altarpieces use the living body as a place of adornment. The biggest link between all of these artists is the importance they place on materials, along with their processing and transformation through handcraft. This collapse of separate narratives regarding art and craft has spanned the course of the twentieth century. Artists and designers like Sonia Delaunary-Terk, Sheila Hicks, Ruth Asawa, and Lucie Rie pioneered a nonhierarchical approach to creative endeavors. Academically, the Arts & Craft movement and the Bauhaus also helped reimagine the framework in which we value a painting, a chair, a sock, a teapot, a sculpture, or a bracelet. Playfulness and irreverence, too, permeates the work of these six artists. Rather than serious and delineated artwork, the process of simply “making” is a major source of joy, sensuality, and aspiration in its own right. * Neuroscience, 2nd Edition. Purves D, Augustine GJ, Fitzpatrick D, et al., editors. Sunderland (MA): Sinauer Associates; 2001.